This Raksha Bandhan, let distance become no obstacle between you and your brother. To the greatest prankmaster you know, it's time to give him sweetest surprise. Order Rakhi from FlowerAura and warm your sibling's heart via its swift and hassle-free online Rakhi delivery in Chandigarh. Rakshabandhan or Rakhi as we lovingly address it, is one beautiful festival that celebrates the sibling spirit like no other. Growing up of brother and sister together, quarreling over goodies and protecting each other, that's what this bond is all about. With Rakshabandhan approaching, all the moments need to be relived, sometimes in memories, and sometimes in real. All the sisters, be it with or away from brothers, begin to pick Rakhis, Rakhi gifts and they also look to order Rakhi online to be sent to Chandigarh, Delhi, and many other different cities. If you are a sister with a brother working or living in the happening city of Rock Garden, parties and delicious north Indian delicacies, Chandigarh, then you must be looking for a reliable and easy option to send Rakhi online to Chandigarh. Look no further. Just log on to FlowerAura.com and a huge display of Rakhis, Rakhi combos, Rakhi hampers along with Roli Tikka and fascinating Rakshabandhan special gifts will welcome you on the site. The most splendid thing about FlowerAura is, that they make same day Rakhi delivery in Chandigarh too and offer superb discounts on Rakhi hampers. The whole tedious task of selecting, ordering and making payments becomes easier than you can think. And on top of it, you get to enjoy free shipping on every order you make. Hence, if you wish to send online Rakhi to Chandigarh, you must experience the magic of the online gift shop, FlowerAura. The cosmopolitan city of Chandigarh is all set to celebrate Rakshabandhan. All the sisters and the brothers residing in the city are waiting eagerly for this utterly amorous festival, for it brings them closer to their siblings. It is the time to bring smiles to each other's face and pour all the love one has for the partner in crime they grew up with. These are the moments when brothers and sisters must be pampered with Rakshabandhan special gifts while making the bond even more special. Sisters, you can now select some breathtaking rakhi gifts for brothers along with the online Rakhi to Chandigarh, along with the doorstep express delivery. it is not a difficult task at all. In fact, it is a much amusing one, at FlowerAura, where you get to pleasure your eyes, heart, and soul while gliding through the spectacular displays of Rakhis, Rakhi hampers, rakhi combos and Rakhi gifts ready to be sent. Just hop on the website, order online and send it via same-day Rakhi delivery to Chandigarh, for the darling brother who awaits eagerly. FlowerAura lets you to choose from a diverse array of Rakhis such as Zardozi Rakhi, Designer Rakhi, Pearl Rakhi, Mauli Rakhi, Rudraksha Rakhi, Diamond Rakhi, Silver Rakhi, personalized photo Rakhi and other Rakhi gifts such as chocolates, teddies, greeting cards, keychains, lamps, cushions, mugs, and many more. 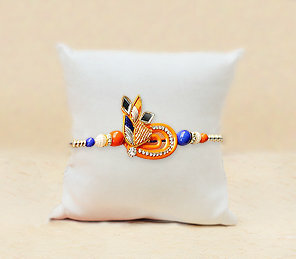 All you need to do is add a favorite Rakhi to your cart and couple it with a Raksha Bandhan gift and FlowerAura will cater to send it via its fast delivery that caters to send online Rakhi to Chandigarh via its prompt and hassle-free online Rakhi delivery to Chandigarh that is known to hand-deliver Rakhi even in the remotest sections of the city of Chandigarh. Even for your last minute realizations, our same day Rakhi delivery in Chandigarh will leave no unturned to turn your occasion into a grand celebration. Your wait is over, the best is here. Just click and send Rakhi to Chandigarh.